I got a solid start to NaNo. I had all my words for today before 9:00 this morning. This year, unlike all the others I’ve participated, I started writing at midnight. Seven other writers from my region met up with my in our group chat room, and we sprinted together, racing to see who could get the most words in 15 minutes. After the two sprints we did, I had just over 1300 words. That’s pretty good, in general, hitting over 650 words in 15 minutes, but they’re some of my slowest sprints yet. My record is nearly 1200 words in 15 minutes, so you can understand that that would feel slow. I got up early, and got in the rest of my words for today. Now I’m trying to build up a buffer, so that if I miss a day for some reason, I won’t fall behind. If I could get at least a couple of days ahead of schedule, that would be awesome. We also had our official kick-off party yesterday afternoon, with an AMAZING turnout! 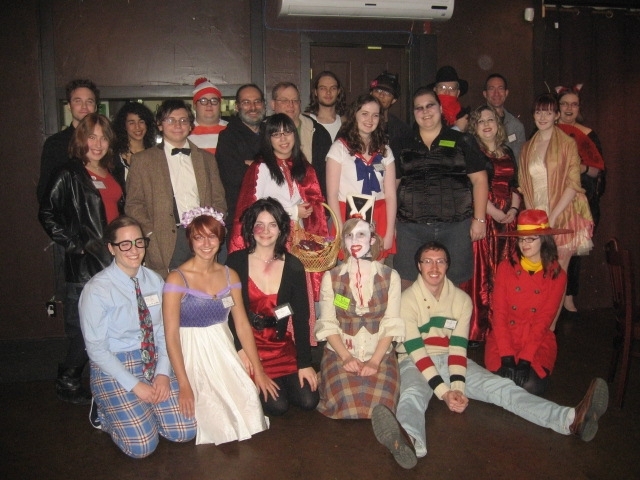 A total of 31 people came out over the course of the party, most of them in costume! We had a blast, and the group is awesome. I look forward to spending more time with them at the write-ins. Here’s a group shot that was taken before the last 6 or 7 stragglers came in. On top of all that, I’m trying to keep on top of the homework situation. I have a huge presentation on Thursday that I’m not quite ready for yet, but I’ll be ready on time, as long as I set my mind to it and get my stuff done. Then I have another one either one or two weeks later. I’ve already started working on that one too, which is good, but I’d really like to get that done as soon as possible, so that I don’t cause myself stress for nothing. That’s actually one of my concerns this year, my stress level. I’m still pretty chill so far, but being c0-ML and organizing everything, plus getting my words in, plus getting my homework done, plus being on student council… It’s a lot. Not too much though. I just have to keep remembering that – it’s doable. That’s all for me, for now. Anyone else get a good start to NaNo, or have any tips for juggling a million things to do? This entry was posted in Writing and tagged NaNoWriMo, productivity, school, Siren Song, time management, word count, work-in-progress, Writing. Bookmark the permalink. 1 Response to And They’re Off!